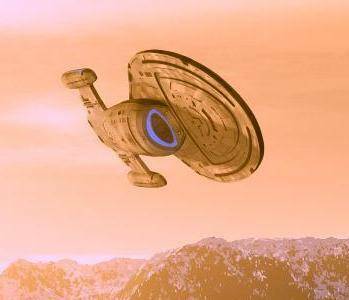 The USS Voyager NCC-74656 was one of the four of its kind made with newly advanced technology that makes it so advanced from the other previous Starships. Its length measures 344 metres and its width is 130 metres wide. 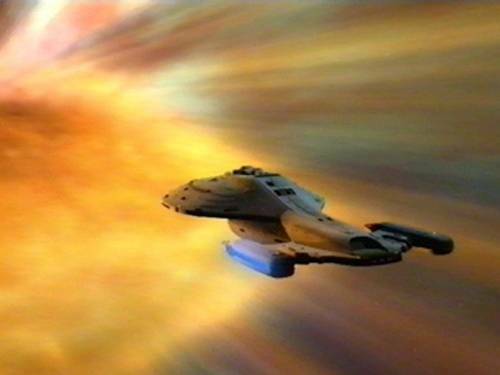 The Voyager is an Intrepid-class Starship. 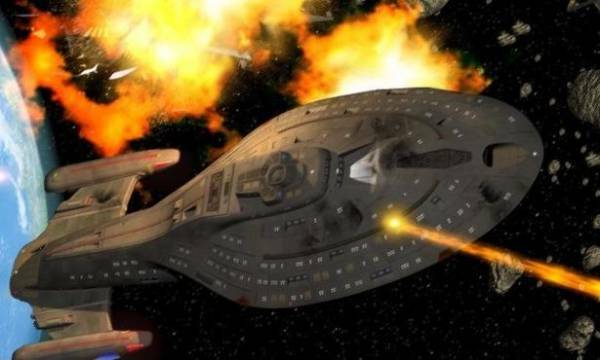 This ship can hold two hundred crew members—though only one hundred and fifty four crew members were recruited when it was first sent into the Badlands to find the Maquis. 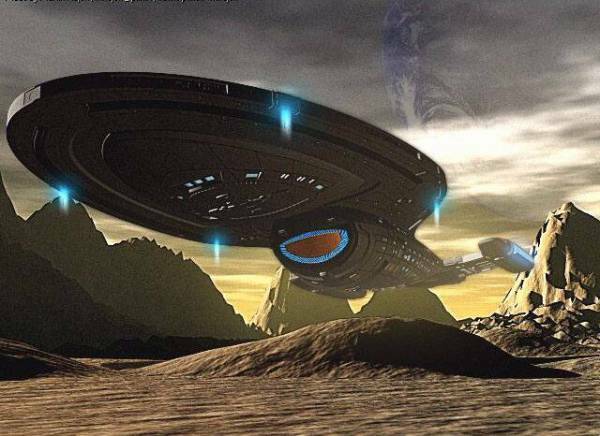 The crew complement however, was somewhat reduced throughout its journey in the Delta Quadrant due to frequent encounters with hostile aliens or anomalies. To compensate, new recruits were added to the positions needing fulfilling. 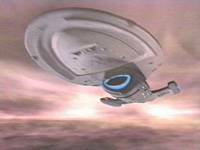 There are fifteen decks on the Voyager—Deck One being the top of the saucer and Deck Fifteen being the lowest deck. 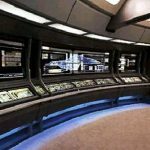 The Bridge, the center of all operations, is on Deck One. 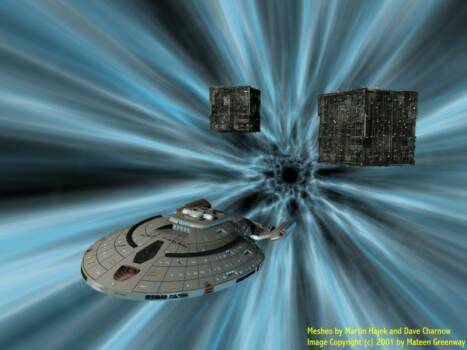 The main source of power to the ship’s systems is located on Decks Ten and Eleven being Main Engineering. 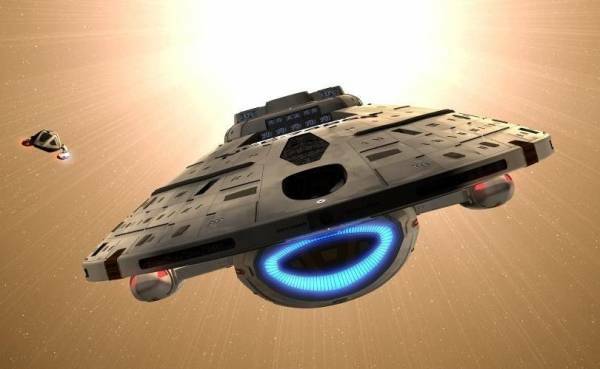 Intrepid-class ships are new classes of Starships with advanced technology. 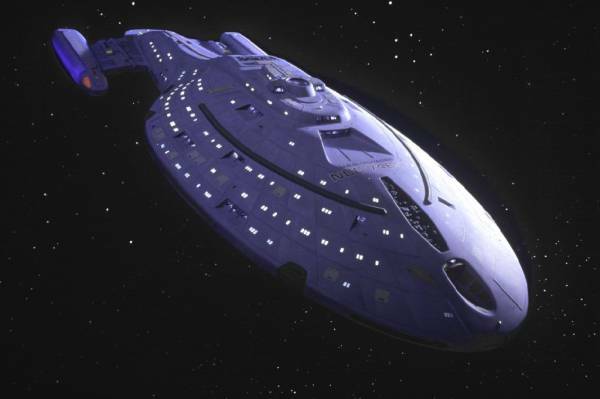 It costs relatively less than a Galaxy-class ship. 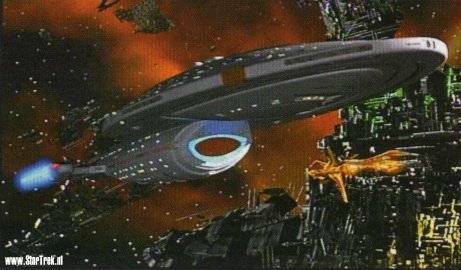 It was built to defend against the Cardassians, Maquis, and the Borg, where the starship is highly maneuverable and was designed for tactical missions. 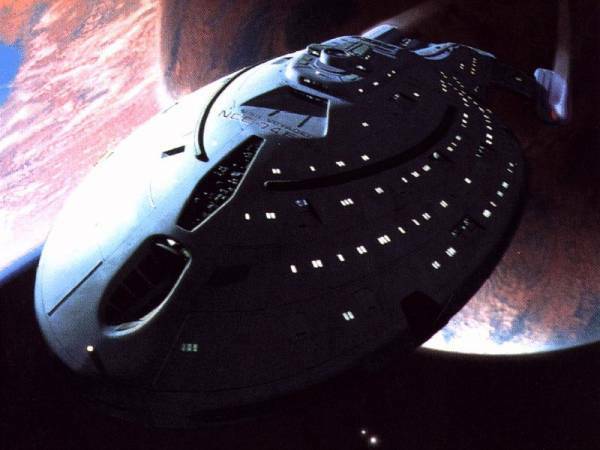 Some of its features are its bioneural gel packs, systems to increase isolinear processors, variable geometry warp nacelles which allows high-warp flight, and an Emergency Medical Hologram which is also installed into this class to handle health of the crew in emergency situations when the resident Doctor is not available. The EMH has become the ship’s main medical personnel when the Voyager’s original doctor was killed in action during their encounter with the Caretaker when they first entered the Delta Quadrant. 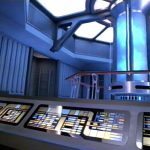 One feature that other Intrepid-class ships do not have is the (ten times more accurate) advanced Astrometrics Laboratory. 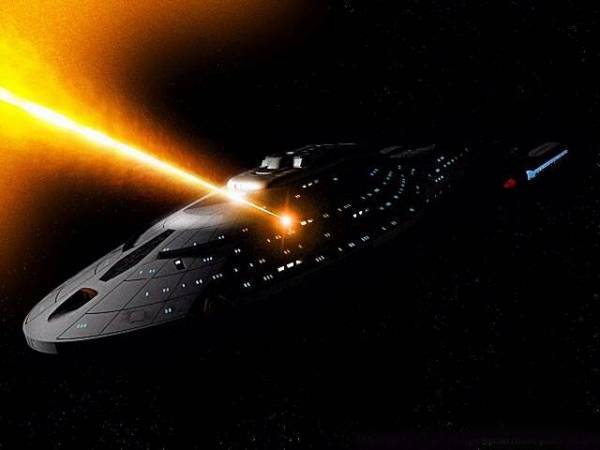 The technological advancement to the ship with Borg technology was added during the alliance between the Borg and the crew of Voyager in 2374, stardate 51003.7. 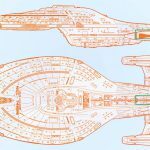 As advanced as the intrepid-class is there are two minor offsets with the ships: they are not designed for families and the replicators are not the most reliable. 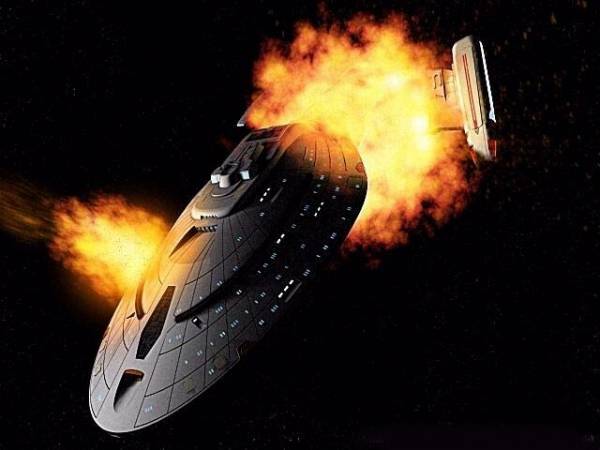 But like all Starships, the Voyager includes a set of structural and operation systems—Self-destruct and warp-core ejection, escape pods, jefferies tube network, bussard ramscoops, reaction control systems, docking bays, and fluid handling systems. 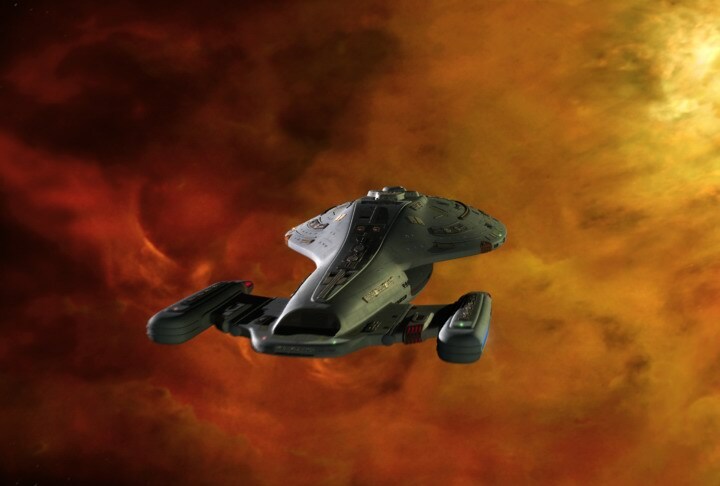 The U.S.S Voyager NCC-74656 is an Intrepid-class starship. 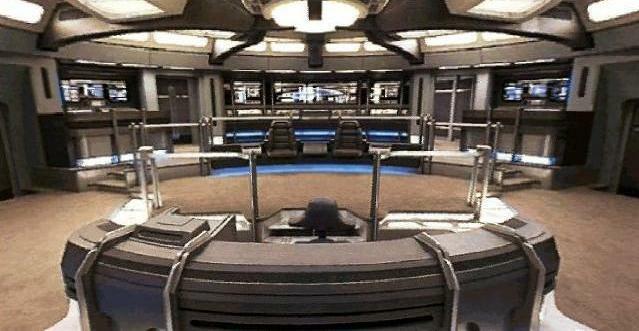 As is the case with all Starfleet ships, the bridge is on Deck 1, at the top of the command saucer. 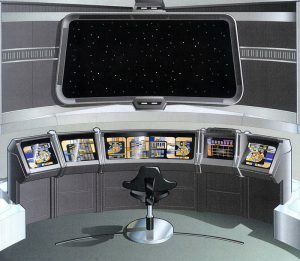 On the bridge, the captain and her senior officers acquire instrument and sensor data, control command functions, access the main computer, analyze situations, and take any action that seems proper. 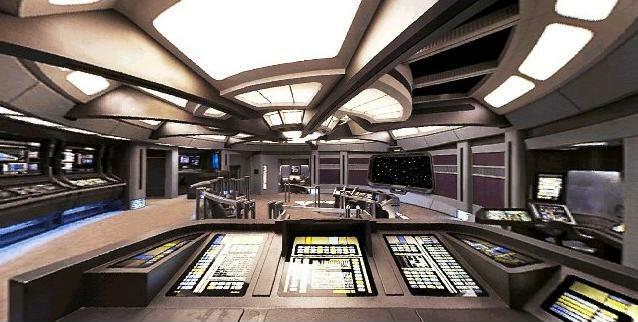 The bridge is the brain of the ship. The bridge area is decorated in tones of silver, gray, and chrome. Control surfaces are black, with the usual array of colored pads arranged into a keyboard. 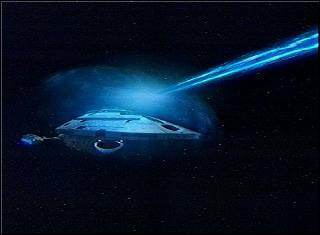 Because the sophisticated onboard computer is capable of determining and executing all routine operations, trained crew members are able to control the ship with a minimum of keystrokes. When it is necessary to enter directional information, one may use the circular ‘joystick’ pad. 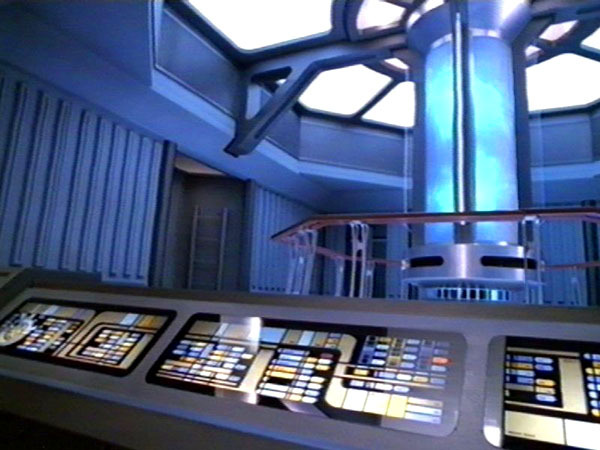 As with previous Starfleet designs, the bridge is a large round chamber. Facing the viewscreen on the forward bulkhead, the command area of the bridge,startrek voyager bridge at the center of the room, contains the chairs of the ship’s two most senior officers, Captain Kathryn Janeway and Commander Chakotay. The captain’s chair is located on the right, the first officer’s chair on the left. Between them is a tactical readout that can rise into view at the touch of a button, ensuring they are kept up to date with the latest information. Directly in front of the command area, the flight controller, or conn, is situated in a slightly lowered area, accessed by three steps. This ensures that the conn officer does not block the line of sight of the captain and first officer. 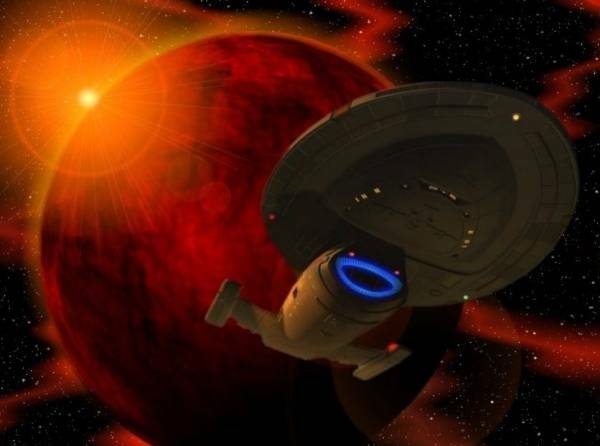 On Intrepid-class starships, ocnn is a single station, arranged in a circular arc; the conn officer, Lt. Tom Paris is responsible for both helm and navigation. A movable chair behind the console allows Paris to slide easily from one end of the long station to the other. The operations station, or ops, is behind the command area and to its left. Ops reads sensors, accesses the ship’s library, allocates ship’s power and computer time, and coordinates the activities of the ship’s departments. 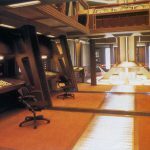 On Intrepid-class ships, conn and ops are located in different areas of the bridge; on most Starfleet vessels, these two stations operate as a pair side by side, directly in front of the command area. The tactical station is to the right of the command area. 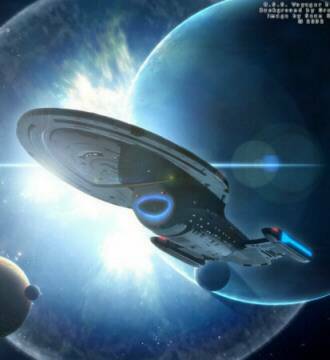 Lt Commander Tuvok, the tacitical officer, is responsible for all ship’s security, weapons, offensive and defensive maneuvers. 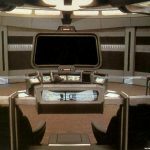 On Galaxy-class starships, the tactical officer stands at the tactical rail directly behind the captain, but on Voyager this duty station is much more self-contained and has the added benefit of a seat-no doubt welcome addition to the bridge design and layout. Starting at the viewscreen and moving clockwise around the perimeter of the bridge, the first station is engineering. 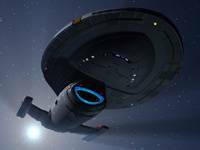 From here, Lt. B’Elanna Torres, Voyager’s Chief Engineer, may monitor and control many of ship’s engineering functions. 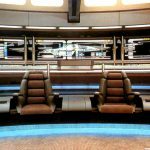 The presence of the chief engineer on the bridge may be necessary during delicate combat, technical, or diplomatic situations. 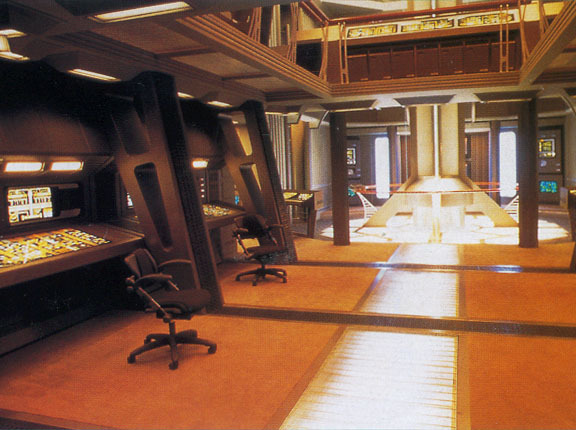 As on other ships, all engineering functions can be controlled from the bridge if necessary, ensuring that Main Engineering is not placed at any disadvantage when the chief engineer’s presence is required on the bridge.Next to the engineering station is a red alert flasher on the wall, followed by the door to the captain’s ready room. 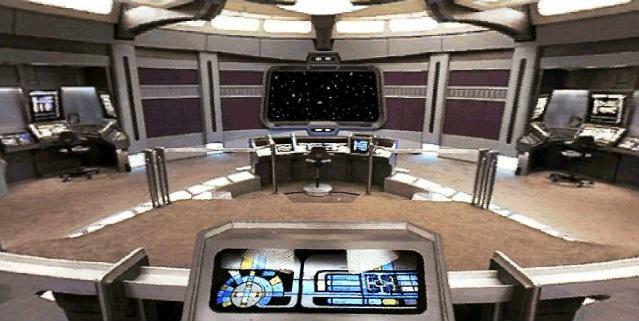 Continuing clockwise, one comes to the tactical station, a self contained area in which a chair is contained behind a low desk unit, the top of which is covered with consoles, as is the wall behind. The chair, sandwiched between the wall and the desk, can face in either direction, giving a clear line of sight to the viewscreen when necessary. Moving on from tactical, one climbs three small steps to come to the raised area behind the command chairs. Just to the left of tactical, at the top of the steps, is the door to the turbolift. 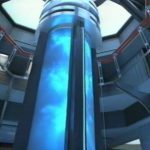 This gives access between the bridge and the rest of the ship. 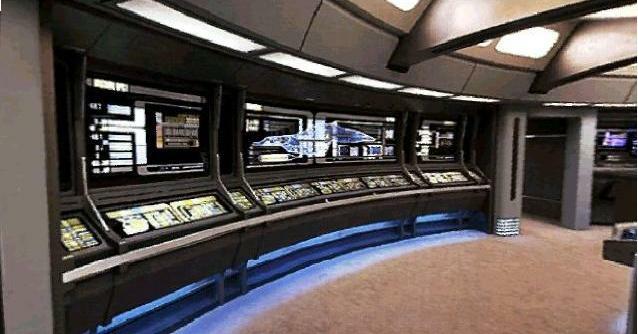 Along the entire back wall of the bridge, behind the command area, are a number of consoles, schematics and display screens, split into three distinct areas. 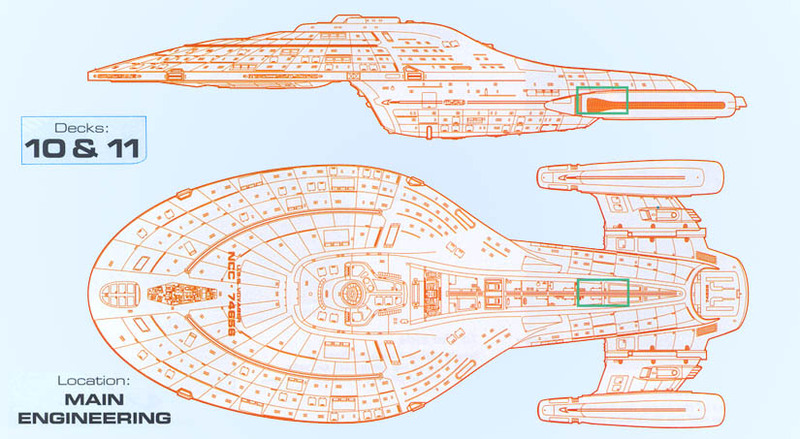 The middle area of the three is taken up by a large schematic of the ship, and is also the bridge’s secondary engineering station. The schematic is flanked by two mission ops consoles, instruments, and readouts. There are no chairs at these consoles, and duty officers working here are required to stand. The Briefing Room is where Captain Kathryn Janeway gathers her senior crew to discuss about ship’s missions, important matters, and any other issues needing to be discussed. 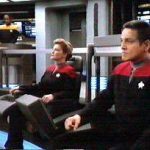 It is a place where the captain can give out orders to her senior crew to give out to their people in their department. The Briefing Room is also used to inform the crew of any new information that has come in during a mission. Meetings held here are also not just to give out orders or give out new information by the captain but to also get some feedback on the current mission from each department and to report anything that has not been reported to the captain yet. Here the captain and the senior crew gather knowledge. Usually the duration of these meetings in the Briefing Room aren’t long. 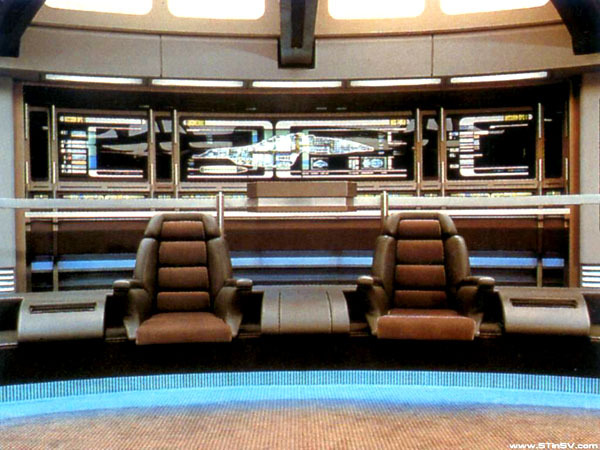 The Briefing Room on the Intrepid-class, USS Voyager NCC-74656, is on Deck one on the left of the bridge. Nearest to the commander’s chair is the entrance door to the Briefing Room. Since it is next to the Bridge, it is quite convenient for the captain to call the senior crew for a brief meeting if it was necessary to rethink matters and to discuss about taking another approach if a current plan is not working. I ts main feature is the elliptical-like table and often around the table is about seven chairs surrounding it where the senior members of the crew attend the meetings. 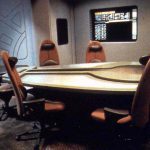 At the head of the table is where Captain Kathryn Janeway sits. Behind her is a large arched window with the view of zooming stars passing as the ship travels through space. Either side of the arched windows are silver designs on the walls. 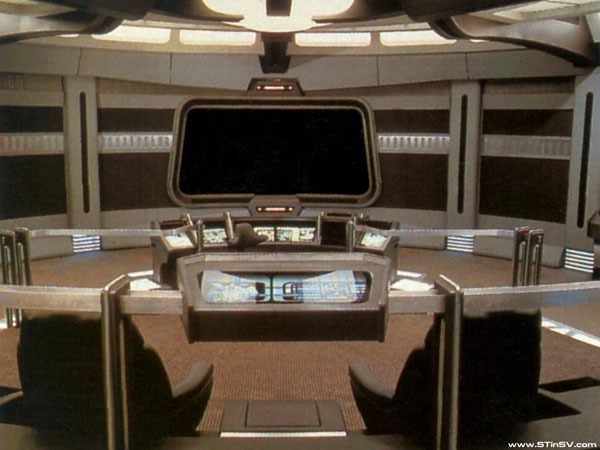 The door from the Briefing Room leading to the Bridge is on the left of the captain’s seat. There is also an exit out of the Briefing Room on the opposite. 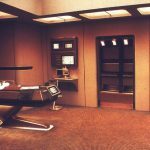 Facing the Briefing Room’s exit is a wall display console. Information here, for example, maps, transmission can be displayed on this screen. – Armory is found on this deck. – Security Personnel’s quarters are located here when they were moved from Deck 9 an infection in the gel pack, needing Deck 9 to be shutdown. – Hargrove’s and Lieutenant Lota’s quarters.